But it appears that bleak assessment is now no longer applicable for the green space in Park Road, which remains a place of joy and serenity for many people. Tony Forster, chair of Friends of Central Park, was one of several people who did not enjoy the “no-go area” headline which accompanied the Peterborough Telegraph piece 12 months ago, but there is no doubt in his mind that the situation has definitely improved since then. “I’m feeling a lot more positive than I was a year ago,” he said. “I want to recognise the support we’ve had, in particular from (Peterborough City Council) cabinet member Gavin Elsey who has been very good. The support included the re-introduction of a winter attendant at the park and will lead to more fencing which will help prevent further damage to the bowling green. The winter attendant provided by Amey - which runs the park - was brought back after the council reintroduced funding for the role. There is also the possibility that a drop-off centre for the city’s Prevention and Enforcement Service (PES) could be introduced into the park. The PES is a single unit combining council, police, fire service and prison staff. Tony said: “We think the more visible presence in the park the more you’re going to prevent the sorts of problems we’ve had. “We’ve also explored with the city council and others the question of CCTV. There’s CCTV in the park but it could be better. There may also be further good news with the Peterborough Society of Model Engineers potentially using the park as their new home having had to leave its former base at Thorpe Hall. Moreover, a number of events could take place this year for people to enjoy at the park. The return of a music festival and dog show are planned, and starting today is the first of several planned dementia walks. Mr Jackson, asked for his latest assessment on the park, said: “I always believed that the park needed a full time presence and that Amey needed to work with the city council and the police to prevent anti-social behaviour and drug dealing all year round. “Things are not perfect but they are improving, and that’s to the credit of Friends of Central Park and others. 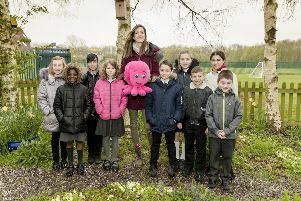 The Friends are now looking to carry out a survey on the park to find out people’s views, and they will seek to continue their strong relationships with local businesses and schools. Tony is also looking to hear from people with their own views and ideas. To contact him, email: jantony@waitrose.com. Labour Park ward city councillor Richard Ferris agreed with Tony Forster that things have picked up in the park. He said: “There are regular users such as ‘BuggyFit’ and the Keep Fit boot camps, and informal groups of Pakistani heritage women who use the park every morning, rain or shine, for walking. “There’s also a considerable dog-walking community who enjoy the park on a daily basis. “Personally, I’d like to see more investment in the park, as every pound spent generates considerably more in terms of health and social benefits. “It is to the credit of Friends of Central Park that it is kept in the public eye, and they have been at the forefront of efforts to ensure that we have a regular staff presence. Fellow Labour Park ward councillor John Shearman said: “Central Park is rightly called a jewel in Peterborough’s crown. “I am grateful to Cllr Elsey for ensuring the funding was reinstated and I fully support the valuable work of the Friends of Central Park, who with Amey and the council are successfully increasing the range of organised activities which take place at the Park. Cllr John Peach, Conservative member for Park ward, also noted the improvement at the park. He said: “The main thing was reinstating the permanent Amey presence. Cllr Peach added: “New fencing should go up around the bowling grounds soon. The next Friends of Central Park meeting is on Saturday from 10.30am at Asda in Viersen Platz, Rivergate.